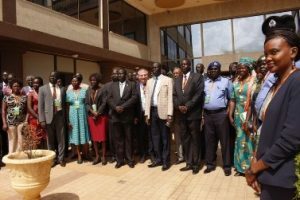 13-9-2017 Juba, South Sudan: Intergovernmental Authority on Development (IGAD) is holding a 3-day consultative worshop in South Sudan as part of the National Consultations towards the development of the Protocol on Free Movement of Persons in the IGAD Region. Acting head of IGAD Liaison Office in South Sudan Ambassador Abdelrahim Ahmed Khalil in his opening Remarks emphasized on the need for the proposed protocol becoming a reality in IGAD region to promote trade and development. Hon. Brigadier General Rieu Gatliek Gai South Sudan’s Interior Deputy Minister, Brigadier officiated the opening and in his remark thanked IGAD for bringing the workshop to South Sudan and said that South Sudan is a young nation that still has a lot to learn from the IGAD region. The three-day workshop is aimed at getting inputs from national stakeholders and experts on benefits and barriers to free movement of persons; deriving national recommendations towards the provisions of the Protocol and developing a road map for the negotiation and adoption of the Protocol in the IGAD Region. The consultation meeting brought together various South Sudanese stakeholders from civil societies, youth, women, Universities government’s ministries of Foreign Affairs, Interior, Labour among others.